This agreement is suitable for any commercial property including office buildings, shops, industrial units such as workshops, warehouses and factories, and even land. Because subleases deal with legal issues in the round, the form of sublease required for a shop on the high street is not different from the form required to sublet a scrap yard. Most commercial leases are governed by property laws which are similar from one state to another. The exception is retail leases, which are subject to state/territory retail lease law. 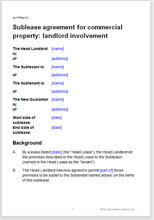 If the term of this lease is longer than three years it must be registered. A sublease carved out of a registered head lease should itself be registered.